Camking, which is also known as Trojan.Win32.Camking is an infection which you will definitely not want to keep on the system because it might do a variety of undesirable activities behind your back. As the specialists of pcthreat.com have found out, it is a very old virus (it was first detected in 2003); thus, it is not very likely that it will infect your system; however, it is still important to be cautious all the time. The most reliable way to prevent similar infections from entering the system is to acquire an antimalware tool and then keep it enabled all the time. If you wonder why Camking is undesirable, you should know that this trojan can connect to the user’s computer and activate webcam. It is mainly done for spying purposes. In addition to this, Camking can save images. As the research has shown, it uses sockets to connect to a compromised machine and even might configure ports. 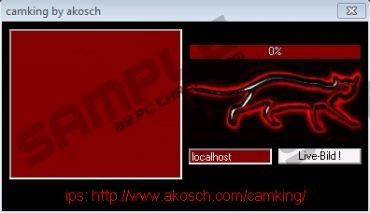 It is known that this infection had its official website akosch.com/camking, which is not working anymore; thus, it is very probable that users tended to download it themselves. Even though it does not seem that Camking used to be a very harsh threat, it is still not advisable to keep trojans on the system. It is very likely that infected files reside in %WINDIR%\OSLoader.exe; however, you should keep in mind that legit Windows files can use the same name; thus, you should not delete it without making sure that the file really belongs to Camking. The easiest way to do that is, of course, to scan the system with a reliable antimalware tool. There is only one advice – you should definitely make sure that the tool, which you are going to install on the system, is reliable because there is plenty of those unreliable ones that might infect your system with a bunch of threats. Even though Camking is an old infection, it still might be used in a malicious way, which is why it is important to keep the system protected 24/7. The most effective solution is to install a security tool, for instance, SpyHunter on the system. If you acquire it, you will be able to remove the existing threats, and protect your PC from future infections that might be even more serious. If you have some specific questions regarding the removal of infections, you can leave your question in the comment box below. Quick & tested solution for CamKing removal.